The Corsair One Elite is a stunning and almost unprecedented PC. It’s one of the smallest systems on the market, yet it’s also one of the most powerful as well. 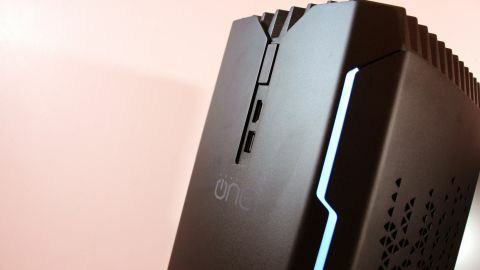 This version of the Corsair One retains the excellent exterior design that was introduced last year, but the internals have been given a huge boost. Corsair reckons they’re perfect for work and play – and we’re about to find out if this tiny tower can cope with a serious upgrade. That latter specification is only really required by creatives, so the Corsair One Pro Plus is also available. It’s got the same processor and GPU, but it halves the memory allocation to drop the price to $2,799 (£2,549). Last year’s models are also still available with a small price reduction. The One Pro has a Core i7-7700K processor, 32GB of memory and GTX 1080 graphics for $2,499 (£2,299), and another version drops down to 16GB of memory and costs $2,299 (£2,099). The situation is different in Australia. Corsair hasn’t yet updated the One to Coffee Lake, which means you’re stick with quad-core i7-7700K processors. The pricier of the two machines has GTX 1080 Ti graphics, 16GB of DDR4 and a 480GB SSD for AU$3,799. The more affordable model uses a weaker GTX 1080 card and costs AU$3,399. The Corsair One Elite is stunning. It’s made of aircraft-grade aluminium that looks smart, with thin bands of light snaking down the rig on either side of subtle logos and the power button. It looks fantastic, and the dimensions are disarming. It’s just 380mm tall and 176wide, and weighs 7.4kg. That’s comparable with the Asus ROG G20CI and MSI Trident 3, which are other recent high-end PCs that used smaller enclosures. The great design is paired with rock-solid build quality. The panels are sturdy, and the interior is built around a strong metal skeleton. It’s perfect for carrying to and from LAN parties or esports events. The front of the Corsair One Elite has a USB port and an HDMI socket, for VR headsets, and at the rear you get more display outputs alongside a USB 3.1 Type-C convector. There’s a PS/2 port, and some of the connections are illuminated for night-tame gaming. Wireless is also included. The top is built with thick metal slats that sit above a 140mm fan that’s virtually frictionless. This is the Corsair’s key heat-removal mechanism, and lifting the slats free give access to the internals. The top of the machine serves up the PSU and graphics outputs, which are routed to more convenient spots using extension cables. The two larger side panels can be removed, and both are filled with slim, long water-cooling radiators. On one side of the Corsair One Elite, a radiator connects to the processor using a conventional mounting system. Buried beneath that is a mini-ITX motherboard that’s based on the MSI Gaming Pro Carbon AC, which has wireless and beefed-up networking circuits. The radiator on the other side connects to the full-size graphics card, which also has a small fan to chill its memory chips. The graphics card connects to the motherboard using a neat extension cable, and the M.2 SSD sits beneath a heatsink on the motherboard. The hard disk sits in a small caddy between other components. The interior is filled with snaking cables and chunks of metal, which is necessary when so much power is installed into such a tiny space. It’s impressive engineering, but it doesn’t always make access easy. The major components are accessible but it’s always going to be laborious, and there’s no upgrade room. It’s certainly easier to get inside the MSI and Asus machines, even if those rigs do have weaker components – and larger dimensions, in the case of the Asus. The only other design issue is the lighting. It looks great at default, but the lights aren’t RGB – so in software you can only alter the brightness, turn the lights off or opt for a basic breathing effect.